Seaside, Monterey Bay, Calif. (August 20, 2016) – Concorso Italiano is the world’s largest gathering of exotic Italian cars, featuring the most famous car manufacturers, industry visionaries and world premieres. Here are the key facts about the 2016 edition of Concorso, held on August 20. Awarding Head of Design for Italdesign Filippo Perini, Founder and designer of Pagani Automobili Horacio Pagani, Chairman of Torino Vehicle Engineering Renzo Porro and renowned designers Ken Okuyama. 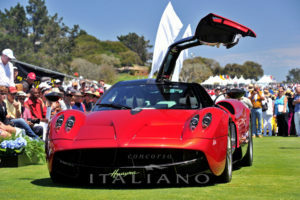 For more information about the event, please visit Concorso.com. Concorso Italiano is the biggest Italian cars rally in the world. Established in 1985, Concorso Italiano celebrates the beauty of Italian design with more than 1,000 Italian cars on display. The 31th Concorso Italiano will take place on August the 20th 2016 at the Black Horse Golf Course in Monterey, California, with more than 10,000 visitors, prestigious Italian visionaries, designers and entrepreneurs expected to attend. Concorso Italiano is represented in Italy by StudioRPR.